Divock Origi has scored a last-gap winner for Liverpool against Everton to secure a thrilling and potentially crucial victory. Watch the Origi goal video below as the Belgian bundled home a scrappy goal from close range to help deliver a 1-0 Merseyside Derby win at Anfield. Origi had missed a sitter not long before that, and more than made amends with what may well go down as the most important goal of his career. 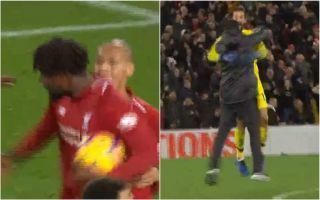 Jurgen Klopp knows how important this is, taking to the pitch to celebrate wildly with goalkeeper Alisson. Absolute bedlam at Anfield to bring about a classic finish to a game that for the most part failed to really live up to the hype. Yang dilupakan kadang menjadi jalan keluar yang baik. Ketika kiper no. 1 Inggris terlihat bodoh ?? Liverpool will feel, however, that this big moment could be a sign they’re really in this title race this season.